I went to get my oil changed on Saturday morning at the local car dealership. I tend to go there because they give free manicures while you wait, but the day was so nice that I felt like walking around the lot. I have no idea why they have the free manicures–they get you by making you bide your time in the lot near the shiny new cars. One in particular looked good to me–it was the type of car I want in a really nice color. But obviously I’m not buying a new house AND a new car. And the more I thought “maybe next year,” there is nothing really wrong with my car. My old landlord is a car guy, and I’ll likely have him check my car out once I move (and can have my boyfriend bring it to his garage during the day). My check engine light has been on for about a year now, but he told me it’s not a big deal and something that he can fix. The main bad thing about my car is that the gas mileage isn’t great. But guess what? The car that I want? Probably just as bad! And once we move, manfriend will be driving me to the train most days (a few miles, and in his fuel efficient car), and even when I do have to drive that myself–it’s a few miles. I really have no need to spend money on a car that I really don’t use all that often. It’s one of those things that I have to tell myself is not worth spending money on, but I still get the pangs–IWantAShinyNewThing! Cars can really be status symbols more than they are means of transportation, and while I think (know) I’ll give in to my desire for that someday, I can hold off until all the loans are paid off. This is not to say I will keep my current car that entire time–I’m not sure my car has that much more time in it, but I won’t be getting the one I covet as my next vehicle. * See that net worth amount? Closing is now supposed to be the 26th, so I should be back to the mid to high (90)s next week. This is what’s standing in between me and five figures of student loan debt (vs. the current six figure number). It wasn’t so long ago that $2,000 would be not even remotely considered “measly” and it obviously still isn’t (because if it were, I’d be in the five figures. But it wasn’t so long ago (January!) that my net worth was in the negative sixes, and I feel like I’ve made a lot of progress since then (to be shortly eradicated by my down payment). And I haven’t been counting the $3,399 – $4,594 that’s in my 401(k) (my contributions to date vs. including employer contributions, which have gained $150 since I started investing in it in January. Why had I not been investing this whole time? Anyways, to complete my circle of digressions, it looks like closing will be on the 26th–exactly two days after our originally scheduled date (tomorrow). I almost burst into tears on the phone with man friend this morning, thinking about the move. He goes away for a week two to three days after the closing, so this gives us no time to paint or do anything to the place, and I have to figure out coordinating moving after he comes back (which involves moving all of my stuff out of my current apartment beforehand). I’m getting upset thinking about it, so I won’t write any further about the logistics now. Because we’re closing two weeks later, it means we’ll be out of pocket a lot less up-front interest, and I’ll have received an extra paycheck before we close. As a result, if I do get a final final paycheck from job 2 on June 30 (which would be $1,350), I’m going to pay off UG3, and maybe throw an extra hundred or two at my federal loans. I hate that they are the largest and have the highest interest rate, and the more I make small payments, the lower my daily interest amount will be. If I dip just under the six figure mark, days later interest will bring me back up again, and on those accounts that could keep on for five months. No thanks. Sorry this isn’t very coherent today–I just haven’t been terribly coherent lately, but hopefully things will be completely settled by this time next month. My last post was on Wednesday the 4th. I’m not sure if my post was before or after, but I basically had a nervous breakdown on the phone with my boyfriend. He felt really bad about everything, and I felt that the issues on our side (and my freaking out about it) were his fault–though really it was something that could have happened to anyone, and was pretty beyond his control. Anyway, he was determined to do whatever he could to get it resolved on Thursday, and was successful! I don’t know if it was his calls that did it, or if we just got the good word on Thursday, but either way, our issues are resolved. Now we wait for the tenants to move out, and I attempt to pack up my apartment. My packing is not going too well. A few months ago my boyfriend and I cleaned and organized my apartment–he did 90% of the work, for an apartment that he doesn’t even live in. And while he did come down to visit me this weekend, he couldn’t stay long because of stuff that he has to get done. Our timing is terrible. I was really looking forward to closing on the 12th, taking a few days off to clean and paint, and pack up my things from here. Now it’s basically going to be putting most of my stuff in boxes, keeping just what I absolutely need, all of which will probably just get loaded into the new place whenever it is that we close. But, now that our issues are resolved, I’m way less stressed about it. I didn’t spend too much in May (in spite of the unexpected trip to New York), and I’m still trying to be good in June. Since we’re not closing on the 12th, I’ll get another paycheck, so I’ll have more of a cushion in my bank account, and the later we close in a given month, the less pre-paid interest we have to shell out. In spite of the fact that I’ve already paid $3,500 toward the house, as of my last paycheck I have about $10,000 in cash sitting in my two accounts. I know that it’s because I had been sending an extra $1,000+ to loans, which is productive in and of itself, but it’s pretty cool to see that I have that much money. The only time I’ve ever had that much money at a time was back when I used to get bonuses–say early 2008. To my credit, I used that money to pay off my car, so I wasn’t completely irresponsible. The bonus I got in 2007–definitely more irresponsible. I will be a little depressed to see it all flow out in a few weeks, but I’ll take it while I can. My goal is to live pretty leanly until it’s (hopefully big) bonus time next year, when I can knock out a few loans. Here’s my debt progress since September (when it shows up relatively accurately). 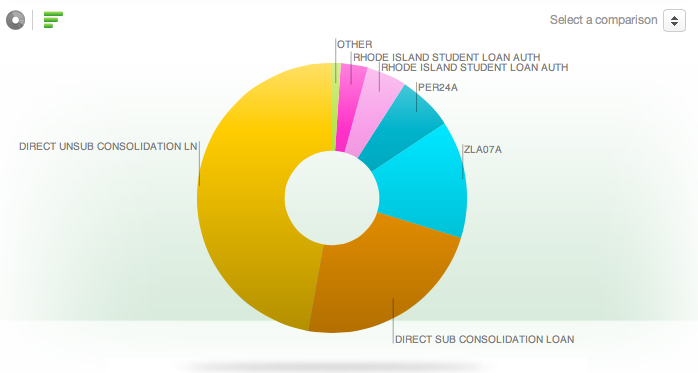 The green is my smallest student loan, which is painfully under $1,000 and my revolving balance on my credit card. I paid an extra $100 on the this month, which hasn’t posted yet, which will hopefully bring it to around $800. While my pay down goals have changed significantly from earlier this year, I’m hoping I can kill this by October. There are two distinct issues that will likely prevent us from closing on our house next week. One is on our side, the other is on the seller’s end. I can do absolutely nothing about either one of these things, except perhaps beg for the requirement to be waived. Essentially my boyfriend’s tax return hasn’t been fully processed, because of potential self-employment tax that he owes. I think he essentially over-reported income, but because he did they think he owes tax. The amount he owes will be less than the amount his refund was estimated to be, so he actually owes nothing but until the IRS sorts it out we’re kind of in limbo. Any advice of how to get them to process things quicker? We sent them in the schedules they were looking for, and will amend it later, but just wanted to give them exactly what they asked for as soon as possible, in order to expedite the process to the extent possible–but I don’t know if it will help. It’s extremely frustrating to be so powerless. Topping that off, I emailed my second job/current living situation, to tell them we might be delayed in closing, and when did they need me out by, since I wasn’t sure I was going to make my original target of June 30. They tell me that they were actually hoping I’d be out before the end of the month. So now I’m closing later and moving out earlier. This does not bode well for painting inside the house, etc. before we actually move in (if it happens at all at this point). The good news is it sounds like I’m still getting paid for the month of June, which I wasn’t positive on, and therefore wasn’t banking on. So I don’t have a definitive date of when my apartment needs to be vacated, but it is likely that I’ll be storing a good portion of my furniture and belongings in other parts of the house, so they can get started on renovations in the apartment–which is going to be totally nicer after I leave. My replacement is getting a washer/dryer in the apartment! So I don’t have much time to pack, which is compounded by the fact that I am only home for two hours a day on weekdays. I don’t think I’ll be able to take any time off this week, so I’ll be looking at a busy weekend of packing, and likely a day off the week after. So I’m basically freaking out.